It shines in the night sky like twinkling stars. It purifies the soul and offers innocent love. It is strong and brilliant, a symbol of power and strength amid unparalleled beauty. Yet, similar to the frozen tears of heaven, its will can shatter, like the splinters of fallen stars. For centuries, it has been the symbol of love and eternity, but like the passage of human lives, love is merely ephemeral when compared to everlasting time. To appreciate the true beauty of Diamond, one must show strength both in appearance and within the heart, combining physical endurance with honest affection. To become diamond is to become exceptional, enchanted with a unwavering beauty that cannot be matched by any, an entity that is rare yet admired with wonder by all. In battle, the element of surprise is a major advantage. By it's nature it's an edge will eventually be lost, so it's important to do something meaningful while you have that advantage. Ichinose Kotomi did held that advantage and did something meaningful with it. Even after a disappointing loss to Furude Rika to end the period, Kotomi made a major impact in Ruby. A stunning upset over Fate Testarossa helped propel the violinist to both an 8-1 record and, as of now, the final spot in the Top 16. She holds that spot by just one win over five girls, meaning that she can't afford to lose any momentum. The bad news is that of her final nine matches, four are against girls who are more-than-likely playoff-bound, starting with today's opponent. Aisaka Taiga's Ruby record was 7-2, but that alone doesn't tell the whole story. A hype-killing upset over then-#2 Suzumiya Haruhi was the Palmtop Tiger's first win over a girl currently in the Top 8 and served as a feather in the cap of an impressive rookie campaign. A win today would put her well on her way to doing the only two things she has yet to accomplish this regular season: go 9-0 in a period and win a necklace. Will Taiga add to her list of accomplishments, or does Kotomi have another upset in her? If there's one thing these two girls have in common (at least in ISML terms), it's that they're not great starters. Asahina Mikuru opened the season with a fairly-unimpressive 5-4 Aquamarine period, while Holo went 3-6 in that same span. But both have bounced back and began Ruby in the chase for a berth in the Double Elimination tournament. Mikuru stumbled to a 6-3, her first three-loss period since Aquamarine. Holo, on the other hand, shined. The Wise Wolf of Yoitsu went 8-1 in Ruby, which was her fifth straight period with at least seven wins. Thanks to others' stumbles, both Mikuru and Holo begin the final period on the good side of the Top 16 cutoff. However, the day begins with five girls tied at 39-15, just one win out of the tournament. With so many giving chase, it may be only a matter of time before one of them makes a move to catch someone. You can bet that the wolf and the time traveler will give everything they've got to make sure they're not the ones who are caught. Thanks to amdrag for providing today's match descriptions. Fate Testarossa in Ruby 6. Suiseiseki in Ruby 7. Suzumiya Haruhi in Ruby 8. Sakagami Tomoyo in Ruby 9. Nagato Yuki in Diamond 1. A girl in the top 12 has suffered a major upset in each of the last five rounds. A streak like that spells danger for any top performer, even Suigintou. The winged doll's recent run can't be ignored, however. Twenty-five concecutive wins have launched the Amethyst necklace holder into the Top 5, including wins over Aisaka Taiga, Hiiragi Kagami, and fellow doll Suiseiseki. If she wants to run her streak to 26, she will have to do it against a very familiar foe. 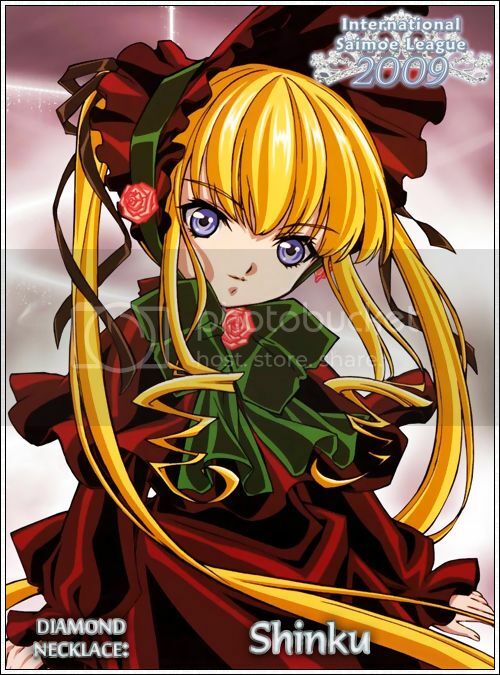 Shinku is Suigintou's fiercest rival outside of Saimoe, and she may turn out to be a pretty fierce rival *in* Saimoe today. She won't be lacking motivation, as she enters the day in an unprecedented SEVEN-way tie for the final two spots in the Tiara tournament. A loss today won't eliminate her from the tournament, but with only seven matches remaining after today, she will have little time to recover from a misstep. Can Shinku keep pace with the massive pack, or will Suigintou avoid the upset bug? ISML's top-ranked Shana, second-ranked Sakagami Tomoyo and third-ranked Suzumiya Haruhi are all being chased by Fujibayashi Kyō for the all-important #1 seed come tournament time. Thanks to a case of the upset bug (with losses to Holo and Fate Testarossa in Ruby), that chase is much less competitive than it was a couple of weeks ago. Even though the odds of Kyō catching all three girls are slim, you can bet that the Top 3 would be more comfortable with a little more breathing room. What's odd is that none of them may mind if the energetic Fujibayashi didn't lose any ground today... because her opponent is Izumi Konata. Last season, Konata made the tournament as a 12th seed and after being sent to the loser's bracket by today's opponent, she was expected to make an early exit. That was not be the case as Legendary Girl A marched to a fourth-place finish and, along the way, ended the seasons of all of the girls currently ranked in the Top 3. Those three wouldn't mind if Konata missed the tourney this year, and thanks in large part to a 4-5 Ruby period and a seven-way tie for the final two spots in the tournament, she's in serious danger of doing so. In a do-or-die situation, can the gamer power-up and get back in the tournament picture, or will Kyō keep her dream of the top spot alive? Both of these girls bring unique experiences to the table that should help them in their match today. Holo's travels with the profiteering Lawrence have given her plenty of experience in dealing with someone who means business, and Hiiragi Kagami means business. Kagami enters this match as perhaps Saimoe's reigning MVP. She won 2 necklaces during the regular season, finished third in the tournament (with her losses coming to the girls who finished first and second), and she won the J-Saimoe tournament. She hasn't been quite as dominant this season, currently 9th in the ISML standings, but she is still a force to be reckoned with. As for the shrine maiden herself, her constant struggles in dealing with her absent-minded sister Tsukasa and the lazy Izumi Konata have taught her how to fight two opponents at once. Facing Holo is tough enough, as she fought her way into the mad scramble for the final Tournament berths with a 15-3 record over the last two periods. But Kagami also has to fight off the upset bug, which has bitten a girl in the Top 12 in each of the last six rounds. Can Kagami avoid the upset and bring the pain, or can the Wise Wolf of Yoitsu score the victory and bring the grain? Even though she's had room for improvement, Suiseiseki's season has certainly been a good one thus far. At the conclusion of the Emerald period, she both won her first ever necklace and surpassed her win total for all of last season. Unlike most contestants, she would need two necklaces to match her eye colors, and it looked as though she was on her way in Ruby after a 5-0 start. But an abysmal 1-3 finish saw the Desu Doll drop from as high as 8th to her current rank of 12th. The girl who currently occupies that 8th spot is her opponent today, Tōsaka Rin. Although anything can happen in the ISML, a 3-win defecit behind the #7 seed means that the best she could hope for is to not lose any ground. However, don't think she has nothing to fight for. A win today along with some losses elsewhere would officially place the Sorcerer in the Double-Elimination Tournament. You can rest assured that she would love nothing more than to punch her ticket to the dance today. Can Rin play her cards right, or does Suiseiseki have an ace up her sleeve? At the dawn of the Diamond period, this match was expected by many to decide the winner of the season's final necklace. Now, the best either girl can hope for is avoiding disaster. The first round of Diamond action saw Nagato Yuki, then-ranked fifth, fall by a mere 16 votes to giant killer Ibuki Fūko. The 5-spot was then taken by Suigintou, who promptly lost to fellow doll Shinku. Now, one of these girls will be looking at a two-loss period with little time to get back on track. With tough matches remaining (Yuki facing Suzumiya Haruhi and Suigintou taking on Ichinose Kotomi in Diamond 9), things may get even worse for today's loser. Which girl will avoid that predicament today? If a girl can get along with a guy whose looks remind everyone of a dragon, one would think that girl could get along with something as simple as a number. But Aisaka Taiga has a big problem with one number in particular: 4. The fourth round of each period has been disasterous for the Palmtop Tiger, as her 0-for-6 record in that round demonstrates. She's finished a period 8-1 three times this season, and the losses have been in the fourth round all three times. A win today would not only end that streak, but also put her in great position to win a necklace. That win would come at the expense of Fujibayashi Kyō. Kyō's chances of a necklace are alive and well thanks to a convincing win over Izumi Konata on Friday. Her chances of an overall #1 seed, however, are on life support. A loss, coupled with a win by Shana, would mathematically eliminate her from the chase for the top spot. But Kyō's never been one to go down without a fight, and you can be sure that today will be no different. Can Taiga get the proverbial monkey off her back, or will Kyō throw the not-so-proverbial book at her? Two weeks ago, nobody would have been shocked if they knew that Miss Hiiragi would be 3-0 and be the top-ranked girl in the Diamond period. Most would have been shocked if they knew *which* Hiiragi would be 3-0. It's not J-Saimoe's defending champion Kagami, but rather sister Tsukasa who currently owns the top spot in this period. That's the good news for the Balsamic vinegar lover. The bad news is that she enters today four wins out of the #16 spot. Even if she goes 9-0 and wins the Diamond necklace, she would still not make the Double-Elimination Tournament. That means that the Diamond necklace is all she has to fight for, and she will fight tooth and nail for it. Her opponent, Asahina Mikuru, also has dreams of a first-ever necklace. But Mikuru also has dreams of a tiara, and the Brigade mascot is just five wins away from securing her spot in the post-season. With just six matches to go and a faceoff with defending champion Fate Testarossa in her future, a win here is critical. Which girl will come out on top today? Few people would be happy to face someone on a 51-match winning streak once, as Saber may have to do a week from today. Saber would love nothing more than to face that challenge twice. Saber's last few weeks have been a rollercoaster of emotion, climbing into and out of the Top 16 repeatedly. As of now, she holds the final spot in the season-ending tournament, which would mean a first round encounter with overall #1 seed Shana. If she wants to keep that spot, she'll have to get a big win over occasional-teammate Tōsaka Rin. In most cases it would be Archer who would be dealing with Saber, but in Saimoe, Rin has to do the work herself. That has suited the Sorcerer just fine this year, as she already has seven wins more than she had all of last season. And if she needed any extra motivation, a win today would guarantee her spot in the Double-Elimination Tournament. This battle could turn out to be far more intense than any battle in the Fifth Holy Grail War. Who will be the last girl standing? Kawashima Ami knows a thing or two about beauty, so she knows that her 4-0 record isn't quite as pretty as it seems on the surface. It's not that she's performed poorly - she's been very good. After a four match losing streak in Ruby, Ami is perfect through four rounds in a period for the first time since the Topaz period. But the opponents Ami has defeated thus far are a combined 0-16 in Diamond, which means that the model will have some serious work to do to have a chance at the season's final necklace. That work starts today against Suiseiseki, who is looking to play spoiler. Her loss to Tousaka Rin in Diamond 3 means that she'll have to settle for just one necklace this season. It also put her in a tie with Asahina Mikuru for 13th overall. A loss today would knock her to 14th and potentially into a much tougher first-round matchup in the Double-Elimination Tournament. With so much at stake, this battle - even though it's between a model and a doll - could get very ugly. Four weeks ago today, we nearly witnessed the upset of the year. Unheralded, unnoticed, disrespected Konjiki no Yami came within 13 votes of shocking the world and knocking off Suzumiya Haruhi, who was then tied for the overal #1 seed. A win today wouldn't be nearly as shocking as that victory would have been, but it would be *much* more devastating for her opponent. That opponent, Saber, is in a tough spot. Her loss to Tousaka Rin in the last round put her one win behind Holo and Shinku for the final spots in the Double-Elimination Tournament. It couldn't have come at a worse time, as her next three matches come against Konjiki no Yami (currently 3-1), Kawashima Ami (4-0) and overall #1 seed Shana (4-0). A loss today would virtually kill her chances of claiming a spot in the Tiara Tournament. Can the Knight stay alive, or will the Golden Darkness shine through? Forget that Suiseiseki lost to Tōsaka Rin last Friday. Forget that Shana has a chance to become the first three-time necklace winner in ISML. Forget this talk about seedings and double-elimination and a chance to win a tiara that could potentially be more powerful than Fate Testarossa's. This is personal. For the first time in all of Saimoe, a head-to-head series heads to a round six, and this storied rivalry has already filled so many pages that it could contain more content than the seventh Harry Potter book. Who would have thought that their first encounter in 2006 Korea Best Moe, in the round of thirty-two nonetheless, would lead to this. First, an unbelievable draw. Then followed a double-Shana loss in both the Korea and Japan semi-finals that led to the only dual-championship in Saimoe history, followed by yet another semi-final appearance in Korea '07 that went to the other side. It was the rivalry that headlined what many say have been the best years of Saimoe, and now, it's back, in the most prestigious Saimoe tournament ever to be created. Counting Suiseiseki's blowout loss to Shana in the ISML 2008 regular season finale, the series heads to Mexico City with a record of (2-2-1), where although the stakes cannot be higher, they're being practically ignored. Sitting thirteenth in the standings trying to stay above the cutoff line, the Jade Stern needs one or two more wins in order to lock up a spot in her first double-elimination stint, but in order for her to beat a heavily favored Crimson Haze who hasn't lost in the past fourteen weeks, she has to focus squarely on the Crimson Haze, as that is what Shana will do toward Suiseiseki tonight. Tonight, both of them must and will focus on each other. Forget the irrelevancy that is Saimoe Japan, or Korea Best Moe, or International Saimoe. This is personal. THIS IS BIG. This match may be the most intriguing of the day. It would be a first-round match in the Double-Elimination Tournament if the season ended today, but the intrigue goes beyond that. Two wins ahead of her ninth-place Katsura Hinagiku and two wins behind seventh-place Nagato Yuki, there seems to be little for Tōsaka Rin to fight for. However, few come into the day with as much momentum as red-hot Rin. She's won 26 of her last 28 matches with only Suzumiya Haruhi and Shana able to score victories over the Sorcerer. Should she score a victory today, she has a chance to run the table and claim the Diamond necklace... but the same can be said of her opponent. For a while, Katsura Hinagiku appeared to be headed for an early exit in the playoffs if not missing them altogether. However, an impressive 14-match winning streak (which included claiming the Ruby necklace) has her spot secured in the post-season. With her difficult schedule, she also has a chance to equal Suzumiya Haruhi's impressive feat from last season: claim the final two necklaces of the regular season. To get those, she has to win today. After that, she faces upset specialist Konjiki no Yami, the surprising Kawashima Ami, and overall top-seed Shana. ... Katsura Hinagiku, welcome to hell. In case you forgot, Fate Testarossa is the defending ISML champion. She's spent the last few weeks reminding everyone of that fact by winning her last eight matches, moving into fourth place overall and putting herself in position to claim the Diamond necklace. Even though the Enforcer has already secured a spot in the Double-Elimination Tournament, she's still in a heck of a fight. She's in a battle for the fourth through seventh seeds, which are all separated by one win. A loss today would put a serious dent in her chances of claiming a high seed. Furukawa Nagisa can't worry about seeding, as she's just trying to get a seed. Thanks in large part to a disastrous 5-4 Ruby period, Nagisa currently stands 17th, one win behind 16th seed Holo. A loss today would be absolutely devastating to her post-season chances, especially with so little time to recover. Who will win this crucial match? If the season ended today, this would be a first round matchup in the Double-Elimination Tournament... and that could be bad news for Fujibayashi Kyō. Kyō's had a rough go of it lately, losing three of her last 12 matches, including a fairly convincing defeat at the hands of Aisaka Taiga in Diamond 4. Currently seeded fifth, a loss would tie her with Suigintou and Nagato Yugi, which means that ending the season in seventh place would not be out of the question. Takamachi Nanoha, however, is heading the opposite direction. She's getting hot at the right time, winning her last eight matches and giving herself a chance at claiming the season's final necklace. A win today would not only give her momentum going into the post-season, but also officially punch her ticket to the Big Dance. Neither girl will be shocked if the match is close, as their clash last season ended with Nanoha claiming a five-vote victory. Will this one be another nailbiter? Not all of the battles this late in the season are for tournament positioning. While 21 girls are still fighting to win it all, one is still fighting just to win something. Kasuga Ayumu is best known for now as Ōsaka, but she may end up being better-known as winless. She enters this match 0-59, and her final three battles are a girl fighting for a .500 record (Sunohara Mei) and two others fighting for a tournament berth (Furukawa Nagisa and Asahina Mikuru). Realistically, this is Ōsaka's final chance to avoid an imperfectly perfect season. Should that win come today, it will be just another frustration for Sawatari Makoto. The girl who knows little of her past isn't liking her present, and with a 50-loss season already assured, one can't blame her. But the dubious distinction of giving Ōsaka her only win of the season would mean bad things for her Saimoe future. Will Ōsaka finally get it together today, or will her name be written into the wrong side of the history books? Thanks to amdrag and minhtam1638 for providing today's match descriptions. Shana's fans could be forgiven for getting champagne and confetti ready, as they know that today could be a VERY good day. It's this simple: if the Flame Haze does the same thing she's done in her last 51 matches - win - she will clinch the overall number one seed in the Double-Elimination tournament. In fact, the ensuing celebration may be the only thing to celebrate in the Diamond period. Her first six opponents are a combined 5-31 in the period, meaning that unless everyone else loses, a necklace appears to be out of reach. However, last year saw only one girl survive the Diamond period unscathed, and Shana knows that it's possible that it could happen again and will give her all to win today. If she does, it could be the death blow to her opponent's post-season chances. Saber is currently two wins behind Holo and Shinku for the final tournament berths. A loss today would unofficially eliminate her from contention, and if that loss gets coupled with a Holo win, that unofficial elimination would be official. But she does have something in her favor: the last ten rounds have seen at least one girl in the Top 12 suffer an upset. With her back to the wall and time running out, can Saber find a way to push that streak to eleven, or will Shana cement her spot at the top of the mountain? All things considered, it's a bit surprising that neither of these girls have ever owned a necklace. Asahina Mikuru has seen her fellow brigade members claim three necklaces between then (Suzumiya Haruhi - Ruby and Diamond '08, Nagato Yuki - Topaz '09), but she has yet to claim one of her own. Fate Testarossa ended last season with a 60-3 record and the number one overall seed, then followed that up by claiming the Tiara. However, she did not finish first in a single period. Both of these girls currently trail Katsura Hinagiku in the Diamond standings and would need her to lose for the necklace to be in play. However, she closes the season with a showdown against top-seeded Shana, so it's certainly within reason. A win for Mikuru would probably lead to a 9-0 record, as her final two opponents are a combined 26-94. A win for Fate, meanwhile, would mean she would still have one last obstacle to the necklace. The defending ISML champion ends her season against last year's Saimoe Japan champion, Hiiragi Kagami. Will that showdown have necklace implications, or will we see yet another girl fall victim to the upset bug? A while ago, this match looked big. Suzumiya Haruhi was in a dogfight with Shana for the overall top spot while Shinku, along with Suigintou and Suiseiseki, was riding a wave of Rozen Maiden momentum and seemed to be unstoppable. Then, Haruhi lost twice and fell back to third while Shinku cooled off and fell back to earth, making this match not-so-big. Now, it's huge. Thanks to Sakagami Tomoyo being bitten by the upset bug, the brigade leader has moved back into second place overall and (technically) still has a chance to claim the top spot. Meanwhile, the demanding doll finds herself in control of her own destiny, and can make the Double-Elimination Tournament if she wins her final three matches. In fact, if their current positions hold through the season's final week, these two would be meeting in the tournament's first round. And by the way, they're both 6-0, and the winner has a great chance to run the table and win the Diamond necklace. Ichinose Kotomi is perhaps the only person in the world who can enjoy her violin-playing, but if she loses today, she may soon be subjected to a sound that even she can't stand: the proverbial fat lady singing. The genius starts the day one win behind Shinku and Holo for the final two spots in the Double-Elimination Tournament. Even if she runs the table, she'll still need losses from both of the girls ahead of her to make the tournament. But before she can watch the scoreboard, she'll have to turn all of her attention to someone with a surprising amount of momentum. Ibuki Fūko has won her last 14 matches, including stunning upsets over tournament-bound Suiseiseki and Nagato Yuki. She won't have a chance to repeat those feats this season, as her run came just a bit too late to make the playoffs. However, Kotomi represents arguably her toughest remaining challenge. Should she win, she'll have a great chance to win the Diamond necklace and end the season on a high note. When this crucial CLANNAD clash ends, will Kotomi be playing sweet music, or will Fūko's star shine bright? After coming within 13 votes of defeating Suzumiya Haruhi in Ruby, many thought that it would be just a matter of time before Konjiki no Yami finally scored a signature victory. That victory hasn't come. In fact, she is 1-14 against girls who would be in the Double-Elimination Tournament if the season ended today, and that victory came against #15 Shinku. The Golden Darkness has one more chance to get that big win this year, but it's not going to be easy. Katsura Hinagiku has won her last 15 matches, including upset victories over Aisaka Taiga, Sakagami Tomoyo and Tōsaka Rin. She also claimed the Ruby necklace, and has put herself in position to do it again in the Diamond period. Of the seven girls who enter the day undefeated, the would-be idol has had the toughest schedule, meaning that the season's final necklace is hers to lose... if she can get by top-seed Shana on the season's final day. Will Hinagiku do her part to make that clash a battle of undefeateds, or will Konjiki no Yami finally get to play the role of spoiler? Nagato Yuki has shown some extraordinary abilities, so would assuming she swapped bodies with Shinku be out of the question? It would certainly explain a lot, as they've been doing impersonations of each other this period. As of late, Shinku has done what the Data Interface has done all season - win. After back-to-back 8-1 periods, Shinku entered Diamond needing one more strong period to make the Double-Elimination Tournament. Through seven matches, she's got it. A 7-0 record seemed unlikely at this point with matches on her schedule against Suigintou and Suzumiya Haruhi, but she has found a way to score victories. Two more wins gives her a shot at the Diamond necklace, but one more win secures her spot in the tournament and gives her a shot at the Tiara. Meanwhile, Yuki has channeled Shinku's performance in Topaz, and has thus far equaled it with a 4-3 record. A loss to Suigintou was not a surprise, but defeats at the hands of Ibuki Fuko and Sanzen'in Nagi were shocking to say the least. A loss here would send her into her regular-season-ending showdown with Haruhi staring at the possibility of a five-loss period. Before Diamond, Yuki had lost five times all season. Yuki desparately needs a slump-stopping win... but at this point, can Shinku be stopped? While Anya is hoping to avoid her third 0-9 period, Holo's sights are set a little bit higher. A win for the Wise Wolf of Yoitsu will send her to the Double-Elimination tournament. "There's no way that Hinagiku can win," they said. "Sure, she's had the toughest schedule in the period and has a large lead in SDO over everyone else. But today, it changes. She's facing a truly elite opponent. One that knocked off Suzumiya Haruhi last period. One that's been on fire all season long. Hinagiku will lose today." Those things were said last month, when Hinagiku ended the Ruby period against Sakagami Tomoyo, and Hinagiku proved them all wrong when she shocked the world and pulled the upset to win the Ruby necklace. Today, many of those people are saying the same things about her match with Shana... but those comments seem to carry a little more weight today. Yes, Tomoyo is elite, but Shana has locked up the #1 seed in the Double-Elimination Tournament. Yes, Tomoyo knocked off Haruhi by over 400 votes, but Shana won by a similar margin and pulled in 100 more votes than Shana did. Yes, Tomoyo had won 29 straight matches going into her battle with Hinagiku, but Shana has won 53 straight, an ISML record when playoffs are included. A win today for Hinagiku would serve notice that she'll be a major factor in the post-season, as well as give her momentum for a potential second-round showdown with Shana. It would also put her in the history books as only the second girl to ever win back-to-back necklaces (Suzumiya Haruhi - Ruby & Diamond '08). There will be no shame in losing to the Flame Haze, and many expect her to do so, but Hinagiku has spent the last two months defying the odds. Can the Kendo Club captain silence her critics one more time, or will Shana continue her assault on the history books? It might be too extreme to say that the wheels have fallen off the S.O.S. Brigade's bandwagon, as the three members are a combined 19-5 in the Diamond period. But at the very least, a few of the lug nuts have come loose. It seems like ancient history now, but at one point this season, Suzumiya Haruhi was literally unstoppable. She had won an ISML-record 68 straight regular season matches dating back to last year, started this season 44-0 and looked like she could end the season undefeated. Since then, the Goddess has gone a disappointing 14-4 and has looked like a mere mortal. Nagato Yuki had avoided the troubles the rest of her brigade mates couldn't, entering the season's final period 49-5. But Diamond has been especially cruel to the Data Interface. Not only did she lose to Suigintou, but she has been on the short end of upsets at the hands of Ibuki Fūko, Sanzen'in Nagi and Shinku. If she can't knock off Haruhi today, she will have lost as many matches in the 9 matches of Diamond as she had in the other six periods combined. The winner will come out of this match with some much-needed momentum heading into the break before the tournament, while the loser will have three long weeks to dwell on this defeat. Which girl will score a much-needed win today? Whenever you have two of the top four seeds in anything squaring off, you know it's going to be good. For Fujibayashi Kyō, today's match is one more hurdle to clear. The class representative can place no higher than her current fourth seed, but a loss could knock her as low as sixth. For Sakagami Tomoyo, this is all about redemption. Today is the warrior's second big test against a fellow member of the CLANNAD clan in the Diamond period. Tomoyo failed that first test, as she was upset by Ichinose Kotomi. Another loss could mean a third place finish in the regular season and raise some serious questions about her chances in the Double-Elimination Tournament. She'll also be looking for a bit of revenge, as Tomoyo fell to Kyō in their match last year. When the dust clears, both of these girls could enter the post-season in the same positions they were in last year... and that could be a bad omen. Tomoyo was last year's second seed, but ended the tournament a disappointing seventh. Likewise, Kyō finished the tournament in 10th place after finishing the regular season in fifth place. Which girl will make a statement today? When this season's schedule was released, many circled this date as the matchup of the year. This battle features the two girls that defined Saimoe in 2008, with last year's ISML champion Fate Testarossa facing last year's J-Saimoe champion Hiiragi Kagami. While it doesn't feature a #1 against a #2 or have any real bearing on the Diamond necklace, this is still a massive, pressure-filled match. Fate Testarossa is in need of some momentum going into the Double-Elimination Tournament. The Enforcer claimed last season's tiara... but she did it as a #1 seed. She will not have that luxury this season, as that honor will go to Shana. A win today could send her as high as fourth, but a loss could knock her down to seventh and, potentially, a tough first round match against either Katsura Hinagiku, Aisaka Taiga, or even her opponent today. Meanwhile, Hiiragi Kagami hasn't been quite as dominant as she was last year. She sits in 10th place today, and could fall to 11th with a loss. She'll have extra pressure today, as Kagamin lost to Fate twice last season; once in the regular season, and once in the winner's bracket final. She will also have all the weight of the Lucky☆Star franchise on her shoulders, as she will be the show's only representative in this year's post-season. With the spotlight shining brightly on both girls, who will step up and claim victory today? Thanks to her last win, this match is not do or die for Holo. The Wise Wolf of Yoitsu claimed one of the final two spots in this year's Double-Elimination Tournament. She no longer has to worry about facing elimination... today. She will (assuming Shinku wins today) have to open the playoffs against #1 seed Shana, which will be no easy task. But even with most of the pressure gone, she can't afford to look past her match today against Suiseiseki. The Doll of Desu-tiny enters this match as the #13 seed, but with Takamachi Nanoha breathing down her neck. With Nanoha favored in her match today, the Emerald necklace winner will need a win to keep from falling into 14th and a first round match against either Suzumiya Haruhi or Sakagami Tomoyo. Can Holo avoid a letdown, or will Suiseiseki stand tall?